I was not one of those kids who disassembled machines to find out how they worked. I was plenty curious about other mysteries of the universe, but kitchen appliances and electronics didn’t intrigue me. I assumed they worked via magic, or as some call it, “science.” Microwaves heat food; freezers freeze them; toasters toast; and that’s all I needed to know. But as I’ve become a more successful backyard gardener, I’ve actually started to wonder about one kitchen area in particular: the refrigerator crisper drawers. After picking fresh baby spinach and strawberries from my backyard, I’m now intrigued by what’s happening inside those mysterious plastic caverns. Should I put all my veggies and fruits in there? What’s actually going on inside ? How do they actually crisp my produce? No longer satisfied with my previous “magic” answer, I talked to experts who could explain my fridge’s inner workings. The most basic bit of information I learned is that crisper drawers work by controlling the humidity in the air around your produce. Fruits and vegetables are sensitive to humidity, so specific areas are needed to keep them fresh. Carolina Biotti, Whirlpool’s global food preservation scientist, tells The Takeout that thin-skinned and leafy produce like spinach, strawberries, and lettuce, are best stored in high humidity environments. (That’s why some grocery stores periodically mist those items in the produce section.) So the main goal of the fruit and veggie crisper drawers is to keep certain produce humid and happy. But refrigerators don’t actually create humidity; they harness it. “Food already has moisture trapped inside it and releases that into the air. In a crisper drawer, you’re putting the food in an enclosed space where the humidity can’t escape,” says Chris Thornton, senior manager of product training at Samsung. In the regular shelves of your fridge, humidity diffuses into the air or gets sucked into a fan. 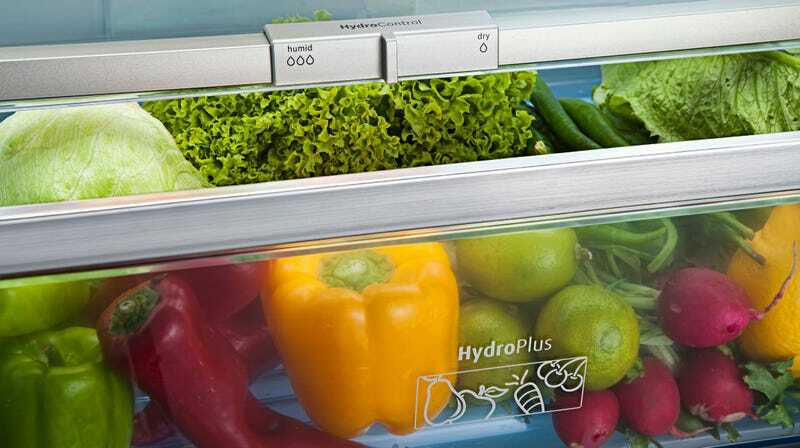 Inside crisper drawers, it’s contained so that it keeps fruits and veggies from drying out. Thicker-skinned vegetables and fruits like onions, lemons, and tomatoes prefer dry environments, which is why they’re rarely refrigerated. If your refrigerator’s crisper drawers have a humidity dial or toggle on them, it’s just a fancy switch that either allows more air flow or seals it off. Turning a dial toward “low humidity” is just opening a vent that allows more air to circulate. It’s not just humidity that’s a variable, though. Labelled fruit and veggie drawers also help separate and organize produce. That’s important because some fruits respond to ethylene gas, a molecule that not only ripens the fruit that’s emitting it, but can ripen other nearby fruits, too. Bananas, for example, are very responsive to ethylene gas, so if you put them in a crisper drawer with ripening apples, they’d ripen and eventually spoiler faster. Another helpful reason to divide fruits and veggies into separate drawers is because an organized fridge helps you know what’s in there. Ever forgotten a head of lettuce in the back of a drawer? It’s not pretty. Biotti suggests placing produce with a shorter shelf life toward the front of your crisper drawers so they’re more visible, and less likely to be forgotten. Ultimately, I learned that crisper drawers aren’t as complicated as I imagined they might be. They’re there to organize your food and trap the humidity that helps keep leafy greens and thin-skinned produce fresh for longer. That’s it!